NVIDIA recently released the GeForce GTX 1070 Ti graphics card at $449 and this card aims to fill the performance gap between the GeForce GTX 1070 ($349) and the GeForce GTX 1080 ($499) to better position the GeForce lineup against AMD’s Radeon RX Vega series. NVIDIA slipped this card into the lineup near the end of the expected life span of Pascal and has done some interesting things on this model. For starters all the GeForce GTX 1070 Ti cards are shipping at the same core and memory clock speeds. This means that clock speeds can’t be used to differentiate between models. NVIDIA told us that they did this to simplify the product stack, but overclockers are free to manually overclock the GeForce GTX 1070 Ti cards for extra performance and 2+ GHz core clocks is something one should aim for. It is hard to believe that the original NVIDIA GeForce GTX 1070 8GB GDDR5 series graphics card was released in June 2016 for $449. NVIDIA has reduced the MSRP on the GeForce GTX 1070 over the past year and the MSRP on this model down to $349 and the new Ti model now fills the$449 price point. 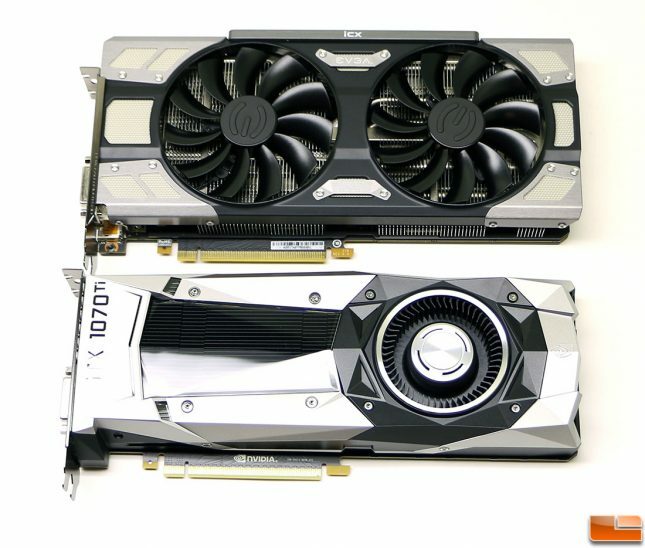 The original NVIDIA GeForce GTX 1070 had 1,920 CUDA cores running at up to 1683 MHz or 6.5 TFLOPS of peak single-precision compute performance. The new GeForce GTX 1070 Ti boosts up to the same clock speed, but has 2,432 CUDA cores for 8.1 TFLOPS. Having 512 more CUDA cores is nice, but NVIDIA also unlocked the number of texture units. Rather than having 120 like the 1070 has the new 1070 Ti has 152! The 8GB of GDDDR5 memory on both cards is clocked at 8,000 MHz (effective) and runs on a 256-bit bus for 256 GB/s of memory bandwidth. The numbers on paper makes it look like a clear win for AMD as it has more cores and texture units along with higher peak compute and memory bandwidth numbers. Looking at numbers on paper and the performance you get in the real world are usually two very different things. Today we’ll be taking a look at the NVIDIA GeForce GTX 1070 Ti Founders Edition and the EVGA GeForce GTX 1070 Ti FTW2. Both cards have the same GPU, stock clock speeds and are loaded up with 8GB of GDDR5 memory. The big differences between the two is that the reference card is just that, a blower style GPU cooler on the reference designed PCB that has an 8-pin power connector. 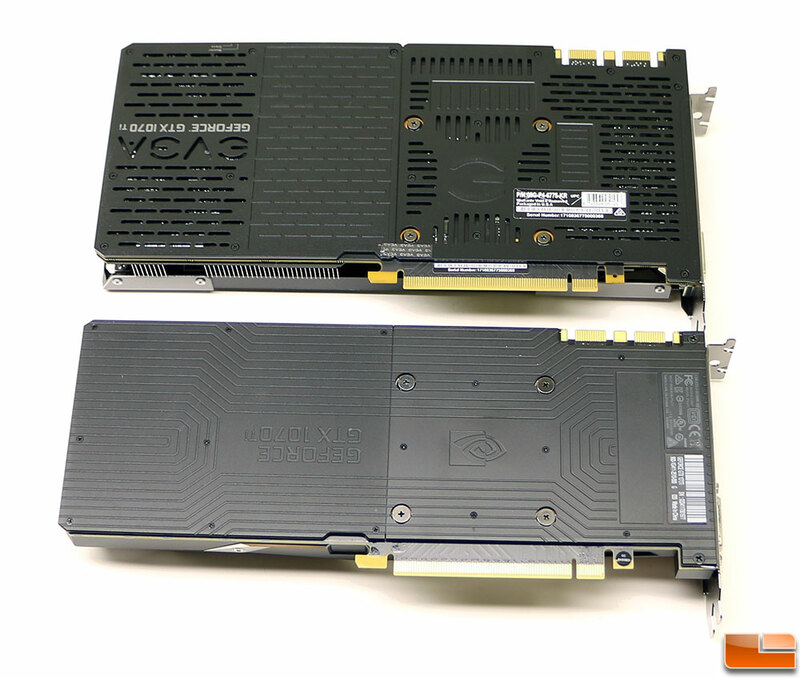 On the other hand the EVGA GeForce GTX 1070 Ti uses a fully custom PCB design with two 8-pin power connectors and their latest high-end dual-fan iCX GPU cooler. Both cards are the same length 10.5-inches and have a silver and black color scheme that should go with most any case design. The EVGA 1070 Ti FTW2 card easily wins the appearance contest though as it has RGB lighting! 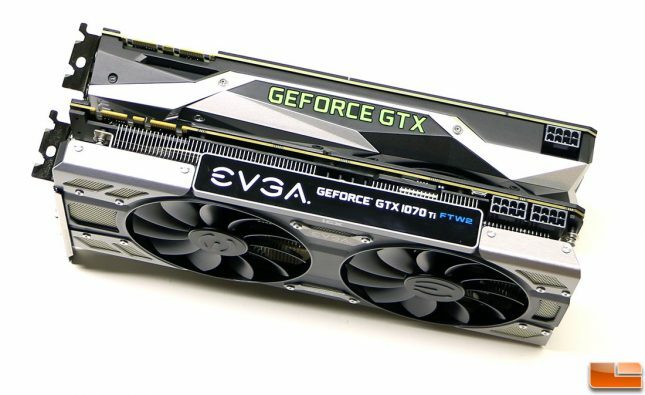 To get these cards running properly in your gaming PC you’ll need one 8-pin PCIe power connector on the NVIDIA GeForce GTX 1070 Ti Founders Edition and two 8-pin PCIe power connectors on the EVGA GeForce GTX 1070 Ti FTW2 graphics card. No big deal to gamers, but if you are mining having one 8-pin power connector per card makes life so much simpler for those that might be running 6+ cards on one system. Overclockers will be happy with the EVGA 10+2 power phase design though as it allows for a max power draw of 235 Watts, which is well over the typical power draw of 180 Watts that a stock card uses. Just to the left of the power connectors on the EVGA card there is a switch that gives you access to the cards two BIOS chips. No other EVGA GeForce GTX 1070 Ti comes with a dual vBIOS solution and this is a feature certainly not found on the reference design. Both of the GeForce GTX 1070 Ti models that we are looking at today have full coverage backplates. This helps protect the components on the back of the card and reduce PCB flex or sag while your card is hanging in the system for years. When it comes to video outputs for display connectivity both cards have three standard sized DisplayPort connectors along with one full sized HDMI port and DVI output. 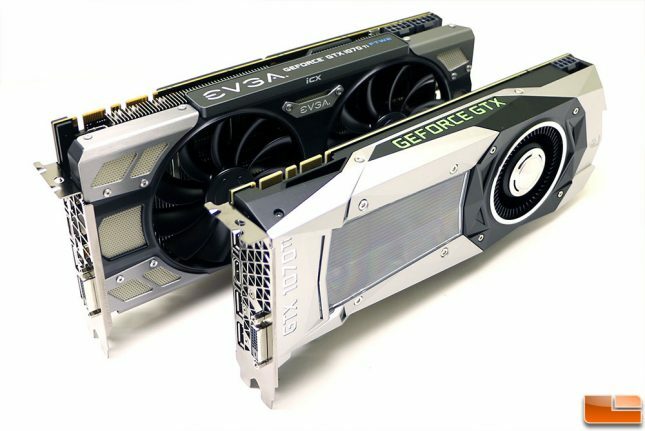 Both cards are true dual-slot designs, but notice that EVGA’s PCB and iCX cooler designs are much taller. How about we spare you the chit-chat and let’s do this! Let’s take a look at the test system and then see the benchmarks!